autom8: control your house. from anywhere. autom8.io: control your house. from anywhere. new! the autom8 source code has been released under the BSD license! grab a copy here. autom8 lets you control your home from your phone, or anywhere else. it also has always-on security monitoring. 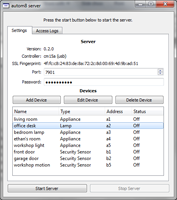 use multiple devices to control and monitor the same area at the same time. if one phone turns on a light, the others are automatically synced. if a security sensor is tripped, all phones are notified immediately. 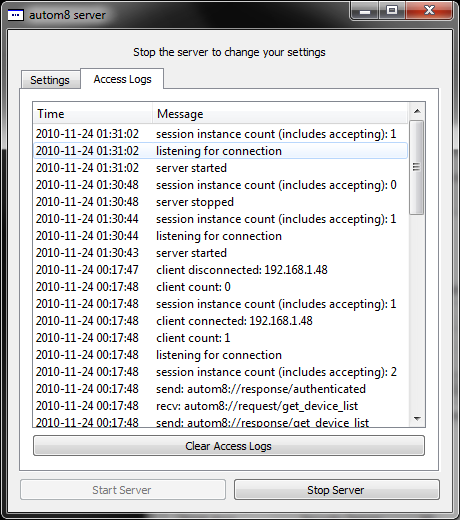 both the client and server use ssl for all network communication, making it relatively safe to use over the internet. the latest version is 0.8.1, released august 23, 2016. download it now..
the current version of autom8 is 0.8.1 and was released on august 23, 2016. please read below for installation information. 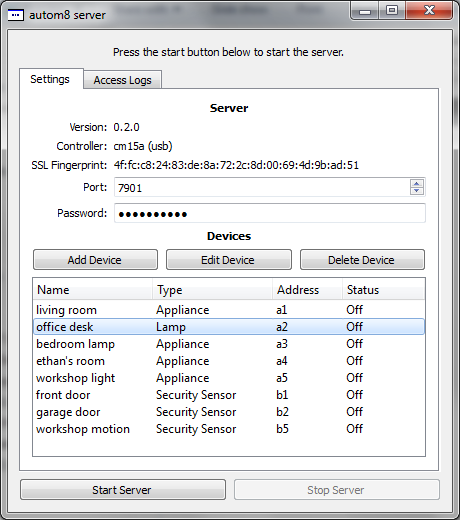 install the ActiveHome Pro SDK on your windows computer. this is required for the server. 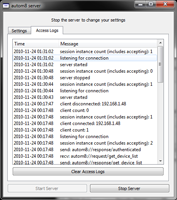 install the autom8 server on your windows computer connected to your cm15a. Install the autom8 client on your android device. added Linux and Raspberry Pi support, plus a web admin app, and web client app. learn more at the github project page. disable ability to create new devices with uppercase characters, leading to device status not updating properly. added the much requested "minimize to system tray"
Q: what is the default password? A: sorry, i'm not going to tell you. please change it to whatever you'd like before starting the server. A: you probably need to configure your router or firewall to forward the autom8 server port (default 7901) to the IP address of the computer running the server. if you don't know how to do this, your router manual or a google search should be able to help. Q: the server starts but doesn't seem to be able to control devices. help! A: you probably need to install the CM15A (ActiveHome Pro) COM modules. The easiest way to do this is install the SDK from here. Q: how do I get security sensors to work? this is considered an "advanced" feature. you need a special controller (e.g. the V572RF32) or use the ActiveHome Pro software to convert all RF ("radio frequency") commands to PL ("power line") commands. if the sensor module is "on" it is considered "tripped"; if the module is "off" it is considered "reset." Q: can you fix the server to work with CM11A/CM19A/etc? A: i'd love to, but i don't have the time. Q: what are the license terms? A: autom8 is currently free for personal use. i accept no responsibility for any damages caused by this software. also, redistribution is not permitted without my explicit written consent! A: not much, but feel free to send me an email if you have problems. i hope you find this software useful -- it should just work if you have the proper equipment.